Submitted photo More than 600 residents enjoyed the picnic in the park last year. This year’s picnic is June 28. XENIA —The Xenia Kiwanis Club is sponsoring a special community picnic in the park beginning 5:30 p.m. Sunday, June 28 at Shawnee Park. 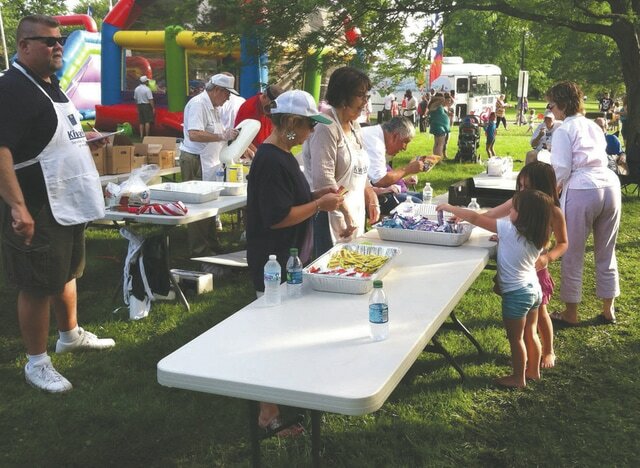 Last year more than 600 enjoyed the day which featured a free meal, entertainment for the children with face painting, balloons, bouncy houses, clowns, the Greene County Bookmobile, and a concert by the Greene County Adult Concert Band. The meal will be a hot dog, chips, a cookie, and water and will be served prior to the concert by the Greene County band’s performance 6:30 p.m.
Six years ago, the Kiwanis Ox Roast became Picnic in the Park, which normally was a fundraiser for the club to help philanthropic efforts to fund youth activities. For the second straight year, the event will not be a fund-raiser but just a free community event. Kiwanis is a global organization of volunteers dedicated to improving the world one child and one community at a time. Most of the Xenia club’s service projects are to benefit children and youth activities locally. Dinner meetings will be held 5:30 p.m. Tuesdays at the Xenia Adult Recreation and Service Center, 130 E. Church St., beginning July 7. For more information about the club, call Michael DiCuirci at 937-376-2328.